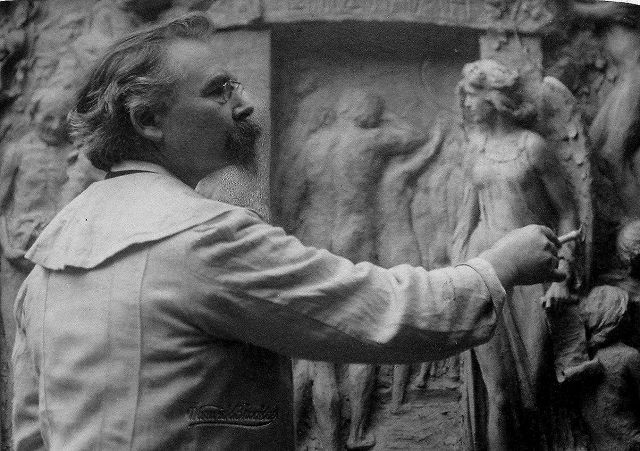 This site celebrates the life and work of sculptor John Cassidy (1860 - 1939). 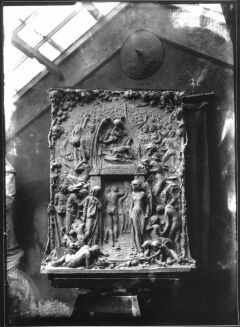 This strange, very large, work came to public attention in January 1909, when Cassidy issued a public invitation to his studio in Lincoln Grove, Manchester to view the full-size clay model. 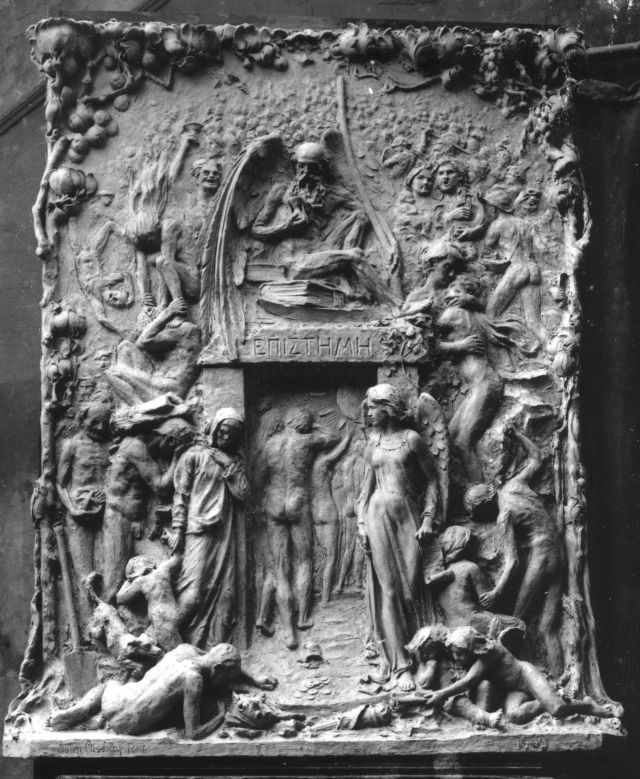 Mr. Cassidy, who is one of the most noteworthy of British sculptors, has just completed, at his Studio in Plymouth-grove a large relief, the subject of which is "The Gate of Knowledge." Those who have already seen some of the products of his genius will say that this new inspiration enhances the reputation which has been accorded the talent of this sculptor. The relief, with its deep significance, is a masterpiece in decorative effect. It is symbolical of human destiny. Simplicity, it is said, is the highest form of art, and we find that this well-known composition is no exception to the classic maxim. In the centre of the relief, which is simple and primitive in its structure and thereby intense in its allegory, is the gate of knowledge through which the spirits of those who have lived on earth pass into the world beyond. On the portal of this gateway is the simple Greek word for "Knowledge," [Episteme] which by its obscure Greek character suggests the hidden knowledge only to be revealed within. Above the gateway Old Time sits on ancient volumes full of mystic lore, which he guards closed and clasped to all who have not passed through the portal. The gate is surrounded by a multitude of figures indicating the development of man and his decline; and encircling this multitude two symbolic trees frame the whole. On the right the exuberance of youth is symbolised by the fruitful vine, and on the left maturity and declining years, experience and knowledge are depicted by the tree of knowledge - the apple. , while above may be seen the the various figures climbing the sharp rocks that make the rough road of life, such as the mother fondling her child, and the warrior who battled for his country, and the woman adorning her hair, who suggests the well-known phrase that all is vanity. Beyond this a vast multitude of disappearing shapes gives scope to the mind of the dreamer of dreams. No less symbolical is the top left side of the composition, where are depicted emerging from the same mysterious multitude such types as the Epicure with his Bacchanalian cup, attended by the demon of misery; the old man of science who has named the stars of the heavens, and the toiler bowed down with at Atlas-load of work - all nearing the mystic gate of knowledge, where young and old, rich and poor, commingle. On the threshold stands Death, a gaunt figure shielding his eyes from a glorious vision, while on the other side of the gateway stands the Recording Angel holding in his hand the scroll of fate. Trough this gateway of knowledge, which is deep with inspired meaning, the spirits who have been admitted hail the glory of the new-found world. It is a composition - a dream of life - which leaves the spectator more impressed than by the speculations of many of our seers and poets who have tried to pierce the veil of human destiny. It is simple in design and also impressive from the decorative point of view, and for that reason it is all the more convincing. Mr. Cassidy has, indeed, succeeded in attaining some of the highest ideals of his calling, and has made an important contribution to the treasure trove of art. 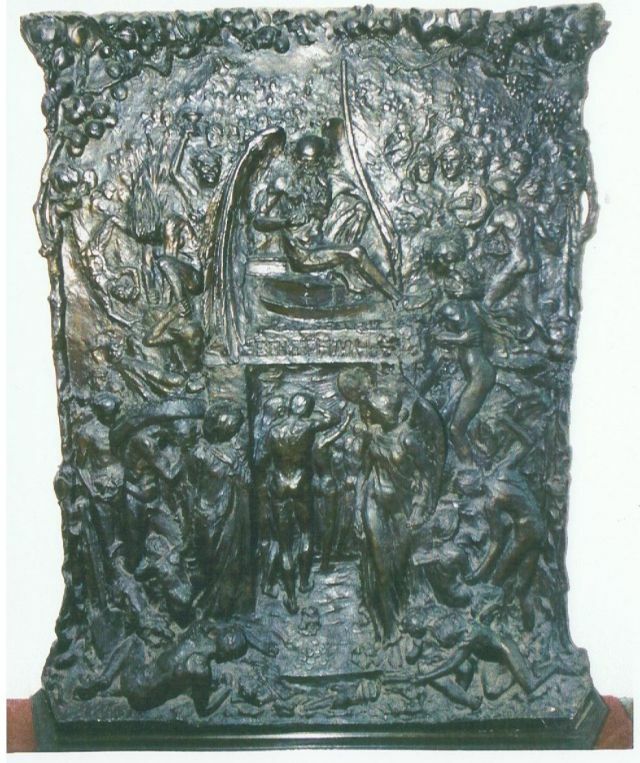 Mr. John Cassidy has just exhibited in his studio in Lincoln Grove, Manchester, the completed model of a large relief, to be cast in bronze, which he has entitled "The Gate of Knowledge." One admires the courage which attempts a problem of allegorical representation entailing the introduction of a great number of figures of widely different meaning and involving changes of treatment from the lowest relief to what is practically modelling in the round. The great difficulty with such an idea is, of course, that of appropriately giving it concrete form. A few men - Watts, for instance - have dome it successfully in modern times, but in this case Mr Cassidy's imagination does not seem to have reached the creative heat at which an abstract conception takes on an inevitable material shape, and this there is evident in the composition a struggle between realism and a rather vague symbolism. Having in mind Mr Cassidy's solid and straightforward work in portraiture, it is not surprising that the realism comes off best, as in the pleasing figure if a pretty child in the foreground. Another feature which strikes us a happy conceived is the frame of foliage which surrounds the work. The photograph reproduced at the head of the page is from a print (shown in full above) kindly supplied by Paul Taylor, who found it among some Manchester views taken by his grandfather, Fred Taylor (1874-1958), a shopkeeper who lived in the Manchester area. 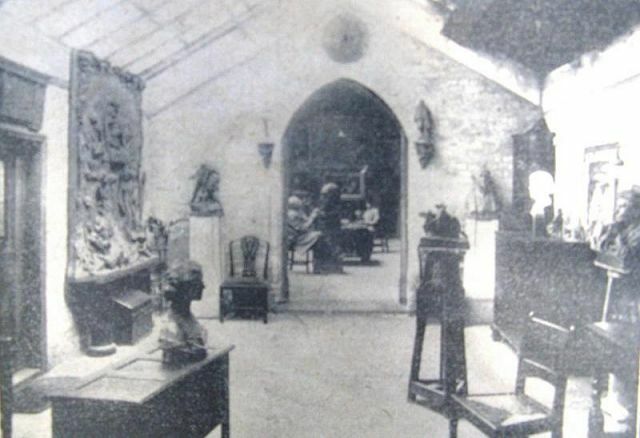 The full image shows that it was taken in the Lincoln Grove studio, no doubt during the 1907 exhibition. The other views taken by Mr Taylor include some other Manchester novelties of the 1907-1909 period, including the new Royal Infirmary, the Cross which had been erected to mark the site of the demolished Church in St Peter's Square, and, the new White City amusement park (opened in 1907) on the Botanical Gardens site in Old Trafford. The Manchester Academy of Fine Arts, especially archivist Sheila Dewsbury for access to archives. Paul Taylor for supplying his grandfather's fine photograph. The clay original - or 'modello' as exhibited, from Mr Taylor's photograph. The version in bronze, as the seen in above photograph from a 2007 auction catalogue where it was catalogued as a 'seven-foot high overmantel from a house in Manchester' and estimated at £10,000. We do not know if it was sold or what may have happened to it since - any information would be very welcome. We have also seen a reference from 2014 to a bronzed plaster version, which maybe the same item, although if so an estimate of £10,000 is unlikely. It is very noticeable that - presumably in order to simplify the casting - some of the three-dimensionality seen in the the original model, especially near the base, has been lost. The base has been enlarged to a more decorative style suitable for mounting on a mantelpiece of a room with a suitably high ceiling. As in many other cases, Cassidy had himself photographed 'putting the finishing touches' to the model, to establish that it was his work. He was aged 49 at this date. man the glorious dawn of a brighter day." A gate, rugged and stern of structure, is the centre of the composition - The Door of Knowledge - through which the spirits pass into the outer world. Above the portal Father Time sits throned on volumes of Mystic Lore, closed and clasped to all who have not passed the doorway. Round about it a multitude of figures symbolise the life of Man, its development and decline, and two symbolic trees frame the whole. On the right is the Fruitful Vine, figuring the exuberance of youth; on the left maturity and declining years, experience and reflection are symbolised by the Tree of Knowledge, the Apple. At the gateway lies a half-extinct torch, dropped by one of the figures that have left this world behind, and a winged being - Youth - borrows Light from it. The right side of the piece is filled with strong and slender forms, personifying Life, its Help, Affection, Love, Music and Labour. A Sower scatters seed, a Soldier is seen fighting, and so the figures mingle and merge into a vague crowd around and about the patriarchal figure of Time. Downward, on the left, is suggested Ripeness of Maturity, Wild Revel, Wretchedness, Despair. 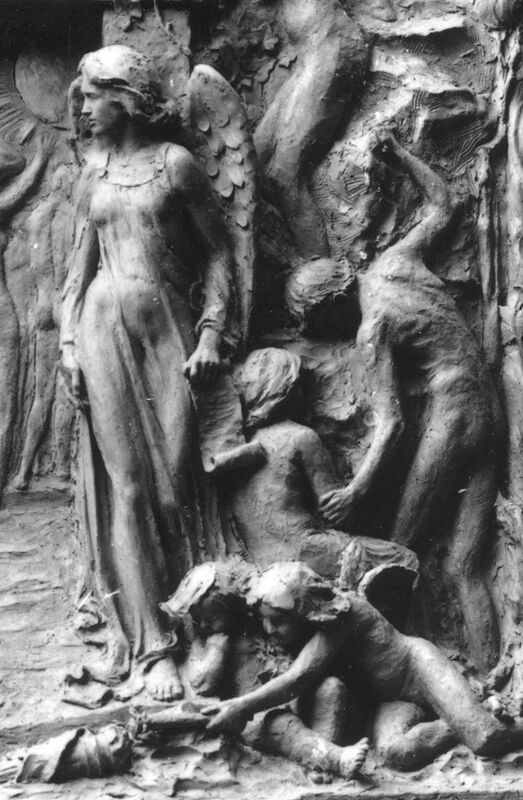 The Worn, the Burdened, the Blind, the Crushed are seen here, and the abandoned spade has fallen from enfeebled hands, whilst at the edge of the Gateway, leading a reluctant Child towards that "Goal of all Mortal," stands the figure, veiled and osseous, of Death, faced across the opening by the thoughtful form of the Recording Angel, scroll and pen in hand. As the figures enter the dark portal they let fall the Torch, the Purse, the now useless Earthly Crown. Veiling their downcast eyes with the hand, they enter slowly, but the foremost are seen to raise their arms with a growing of joyful Hope towards a bright Orb just visible, and no more, from the outward of the Gate. This rare photograph is from a newspaper article on the enforced closure of the studio in 1928. What looks line the original version is in place over what seems to be a small room heater. The Edwardian decade was a time when Cassidy's popularity in the North-West was assured. Lucrative commissions from the John Rylands Library, James Gresham and others offered financial stability, perhaps encouraging him to indulge in the creation of symbolic work on his own account. Some of the ideas in 'The Gate of Knowledge' seem to be related to the theme of the major work 'Adrift' completed in 1907. Clearly he was a reader and thinker: a tribute perhaps to the teachers in the National school in the village of Slane, County Meath, where he received his general education. Another alumnus of the school was the celebrated poet Francis Ledwidge. 'Googling' the phrases 'Gate of Knowledge' and 'Door of Knowledge' leads to a wide variety of references in religious and philosophical writings, and some other art works, but which - if any - of these was Cassidy's inspiration it is impossible to know. It would be interesting to receive a critique of the work from a present-day art historian. A detail from the Taylor photograph showing the "genius of youth" taking a light from the discarded torch, the recording angel with pen and scroll, and some of the figures struggling on the rocky climb. A resemblance to the style and message of the contemporaneous work 'Adrift' is clear. Page compiled by Charlie Hulme, June 2016.